Arriving in Austin and picking up our registration materials at the Sheraton downtown, one particular number dominated our interest. "What's the water temperature at Walter E. Long park?" 78 degrees. Just wetsuit legal. Great news! Mike W. figures wearing a wetsuit can improve your swim time by 10 minutes. In any case, I'd never done an open water swim without one and I did not wish to lose any potential advantage in this race. That was pretty much the sentiment of the entire field. Flash forward past my best swim result to date, improving six minutes over my previous time, we learned mother nature conspired to give us all another advantage. Wind gusts moved the buoys which marked the course, shortening it noticeably. There went my one bright spot for the day! After putting in a solid pace for the first 20 miles of the bike course, my performance diminished precipitously through the final miles on the bike and into a challenging run. 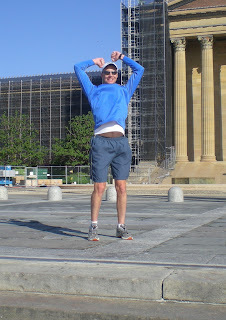 While I felt mentally prepared for this race, my conditioning (or lack thereof) really proved to be my undoing. I finished, marginally beating my time from Buffalo Springs Lake, but came in far short of my personal goal for finishing the Longhorn. Mike W. found the course tougher than expected as well. He set an ambitious goal. While he missed it, he set a personal best by a significant margin, had a great race by any standard, and had to wait around well over an hour before I crossed the finish line. We had fun. That should be the point of it all, right? These events are always a good time. This race had an deep field of professionals and impressive age-group athletes. While I "bonked" on the run, I could still smile and chuckle at my overconfidence. What's next? Working on my run, both speed and endurance. Same on the bike. Fall and winter time in Texas allows for training outdoors during the months many others around the country are forced to head indoors. I like the idea of training for a marathon in order to keep a disciplined schedule to focus deeply on my running ability. The Cowtown Marathon in Fort Worth in February looks like a great target race. Short course racing looks pretty good right now too! 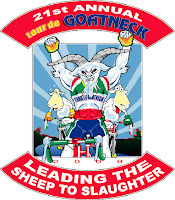 Lots of riders use the Goatneck as a warm-up for the Hotter'N Hell 100 mile ride in August. Some folks say that the Goatneck is even tougher than the HH100 in some respects because of the persistent rolling hills across the 70mi course. The HH100 is flat, windy, and well, hot. Though it's plenty hot in July too! By the time we stepped off the bikes for last time today, the mid-day thermometer was reading in the 90s. The reported 3,000+ riders today received ample support on the course. Rest stops are spaced every 7-8 miles. SAG wagons (anyone know where that name comes from?) ensured distressed or disabled riders did not wait long for help. And the volunteers do a wonderful service and a great job every year - today was no exception. My trusty riding partner Mike W. had to skip this race. As expected, I found some old TNT training buddies to ride with and even dear Coach Tom to visit with during the rest stops. Tom is looking strong as usual, and like many others from today's crew, will be heading to Austin in October for the Longhorn 70.3. In summary. The Goatneck rocks. Today's distance was my greatest to date - so that's a new challenge met, heh! Tomorrow we ride! Yee Haw! Runner's World magazine decided to send me a few free issues - they got my name from the Cowtown Marathon. Smart move; it's a good read thus far and I just might subscribe. This August issue features a Houston family, the Crews, and their story with TNT and triathlon which began after husband and father Bill Crews beat his stage-four non-Hodgkin's lymphoma after being diagnosed in 2004. You'll find the full article, "Team Work," here on the Runner's World Web site. It's a story with a very happy ending. It might offer a bit needed motivation for you as well. Enjoy! The headline on IRONMAN.com reads, "Some fast age group racing in Buffalo Springs Lake". About 1,300 athletes came out for this year's race. Being part of the official IRONMAN 70.3 series, which offers qualifying slots to the ultimate IRONMAN event, the Ford IRONMAN HAWAII, in Kona, this race attracts a remarkable group. Neither the wind, rain, nor hills deterred the leaders in the group from posting some amazing times. The overall winner was Leon Griffen from Boulder, CO with a time of 3:58:35. The female pro winner was Mirinda Carfrae, also of Boulder, posting a time of 4:23:28. Mike W. had a great race, despite some hiccups during a somewhat chaotic swim start. The pro wave began the event, and these pros first ran along the shoreline for the first several hundred feet of the swim before diving in to the water. The subsequent waves took this strategic tip and followed suit. In our wave, after Mike began his swim, another athlete dove on top of him, dislodging his swim cap and goggles. Mike, flustered and out of breath from having just run through sand and water, gathered himself, got to shore, and quickly recovered his gear. He still managed to complete the swim in under 32 minutes. Awesome time! The bike and run were as impressive, and strong enough to give Mike a sub-six hour time on very challenging course. For my part, I scrapped in just under seven hours at 6:50:56. I managed to slightly improve my swim time over the recent Galveston race, but the tough bike course took it's toll on me and highlighted well the areas in which I need to improve: leg strength and core body strength. Overall, Buffalo Springs Lake is a great race, and within a short days drive in Texas, it will be one I hope to do again. Though since Mike registered for the Coeur d'Alene IRONMAN, which takes place the week prior in 2009, and I'll making a trip to New Orleans for SHRM 2009, next year's not an option for either of us. That's one commonality with my work and triathlon training: trade shows and IRONMAN racing need to be planned at least a year in advance. Mike W. and I depart for Lubbock in the morning, about a four hour drive from Fort Worth. We'll pick up our race packets, scope out the course for the first time, get in a short practice swim, and go over our last gear checks before a 4:30 a.m. rise and shine Sunday morning. We've to a 6:40 a.m. wave start Sunday morning. We're both a bit nervous about this race. Mostly just jitters, I think. Wish us luck! I swam my race distance, 2,000 meters, this morning. Tomorrow, I'm planning on a brick workout with a long ride and short run -- before the 101 degree forecasted heat takes over the day. Mike W. (who really needs a blog I can link to) and I are independently getting ourselves as mentally and physically ready as we can be for Lubbock. 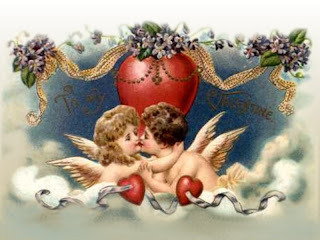 And reassuring each other "to just go have some fun" and not to stress what will no doubt be a very challenging event. This will be the first long course Mike and I have done together. I cheered him on for his first Half Iron at the Texas Man in Denton. He was on hand for my first long course race at the Lone Star in Galveston. We did the Benbrook Sprint Triathlon together in May. I will no doubt be chasing Mike from the start at Buffalo Springs Lake. He's great to train with as he's a menace in the water, a terror on the bike, and pretty mean on the run too. Despite having a new born baby at home and missing many hours of training, I fully expect he'll have a strong finish in Lubbock. One of my favorite podcasters and authors, Joseph Jaffe has put his own consulting time on the eBay auction block as a fundraiser for his Team in Training campaign. He's going to run the Nike Woman's Marathon in October. I'm delighted a favorite cause just got the marketing muscle of a favorite thought-leader. He's being joined by several peers in truly social endeavor. Best of luck to all of you! I'll try to post a direct fundraising link here soon. On a recent business trip to Philadelphia, I was grateful for a beautiful cool morning and an hour free for a morning run. My colleague Kevin and I set out from our hotel and headed toward the Philadelphia Museum of Art, the site of the famous steps depicted in the Rocky movies. We're both uber-dorks in our own unique ways, but on this excursion and it's status as a "must do," we agreed completely. You'll notice these two snap shots which depict me at the top of the steps in my victory pose. 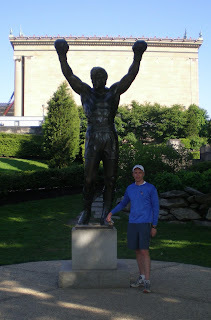 I had remembered the bronze statue sitting a top the steps (in Rocky III, I thought), but the statue today sits near the foot of the steps at street level. Philly was a neat city to visit. Between the Rocky run and the refresher course in revolution era America, we had a great time during the few hours we had free to play. You'll be happy to know that our team of 35 triathletes collectively raised $94,7 61! That's enough money to provide 189 families with monetary assistance through our financial aid program! So the next time you see one of your fellow alumni, be sure to say congrats to each other on helping The Leukemia and Lymphoma Society get one step closer to finding a cure! You Trained, You Endured, You Achieved and You Mattered! Thank you for making my job so much fun and rewarding! And thanks again to all of the Team Goodman supporters who made the real difference this season! You all rock! Team In Training brought something like 175 athletes to the Lone Start Triathlon. Seemingly, an equal number of TNT coaches, mentors, staff, and participant family members rounded out our numbers. All of us running in the green and purple have a distinct competitive advantage. Because we're running in support of a cause that every one can get behind, we get support from voices known and unknown all along the way. At no point in the race did I need the motive force of the "Go Team!" cheers more than I needed them on the run. I came out of T2 as my watch chronograph ticked past four hours. I can do this, I thought to myself. A sub six hour race was within my reach. Watch time was now 11:30 AM in the morning. The day was heating up. The forecast called for a high of 85 degrees. It was humid. The run course was amazingly well supported. Stations with Gatorade, water, cola, chips, pretzels, and gels were set about a mile apart. A few wet sponge stations were put into the mix - volunteers took thousands of sponges, soaked up cold water out of rubber trash barrels, and handed them to red faced runners. This was welcome relief for my sweating head which was also crusty from saltwater and sweat residue. I continued to concentrate on my nutrition for the first run loop. My cramping stayed confined to the bike. If I stayed hydrated and well fueled, adding in some sodium intake according to my original plan, I had a shot at pulling this off. It was not to be. A different set of circumstances conspired against me this time. My sweat from the heat and the humidity, the wet sponges, and the cold water I poured on my head all seemed to find a comfortable home in my shoes. My feet were strapped into wet and squishy messes. By the time I realized I was blistering and tightened my laces hard to adjust, it was too late. First the left foot. Then the right. Looking back now, I feel like a bit of a blister wimp. My mind's eye imagined horrible sores forming into festering and bloody messes. In actual fact, I've got a quarter coin sized poofy pad of fluid on my left foot and a dime-sized pad of fluid on my right. But like the cramp on the bike, it was distracting enough to alter my run pace and intensity. I tried to 'run around' the blisters. 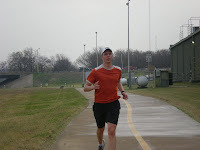 I shifted my stride in order to strike more toward the outside of my foot with each step. Boy, I'm paying for that two later as my feet are the sorest part of my body. The cheers of encouragement from Coach Rodney and all of our supporters helped me immensely. All in all, I ran 20 minutes slower than I needed to and knew I was capable of doing in order to hit the finish line before the clock ticked past six hours. It's easy for me to be all "woulda, coulda, shoulda" at this point. I can tell myself that my heart, lungs, and legs were up to the challenge, it was just my feet that had a bad day. Maybe that's true, maybe not. In any case, it's all got to come together on race day. And this is how it came together for me on this day. You know what? The finish line still felt damn good. Fort Worth, Texas has a strong bicycle scene. We've got long, windy, and winding roads. We've got parks. Bike shops abound. I've been lucky enough to ride with a group of new friends outside of TNT with much stronger bike legs than I have. Cyclists seem to age well. I've got something to look forward to, as my hairline recedes, my quick-twitch muscles will continue to develop. 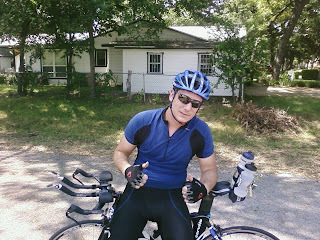 Up until Sunday, the last time I rode more than 45 miles in one-day was back in 2002 when I did the MS150 from Houston to Austin over two days. Fortunately, this ride at the Lone Star Triathlon in Galveston is flat. The path follows the shoreline for most of the distance. The wind was to be the x-factor. But it applies itself more or less equally to all. Our coaches did an admirable job of beating into our brains the importance of race nutrition. Fuel, hydration, and electrolytes all must be maintained in order to maintain oneself upright in the race. So nutrition was my primary objective during the first quarter of the bike. I popped a gel. I drank water. I nibbled on a Clif Bar. I drank more water. Every 15 minutes or more I hydrated. By mile 23, I had to pee. A portable pot parked by an aid station was free as I slowed down to take a bottle of water from race volunteer (an awesome group of people, I must say!). I made a sudden stop and hopped off my bike. Something in the combination of the inertial forces and the particular chemistry of my legs conspired at that moment to create a cramp. I completed my pit stop. Crap, I thought, as I peddled back onto the road. I've dealt with leg fatigue before, but never an outright cramp. My left hamstring (I believe) was the offending muscle. It was not very bad though. I could still peddle. Mentally, it was a distraction. I had to work around it. Find a motion that did not further aggravate it. Pull back my effort as it began to tighten harder. Pick up the effort again, but not so much. And so it went for the next 30 miles. "How is this going to feel when I get to the run? ", was my other thought. I wanted to finish the race in under six hours. I did some calculations. I was still within range if I could finish the bike at the four hour mark. I believed I had a sub two-hour half-marathon in me. I did all I could to consume electrolytes until the finish in order to help the cramp. It wasn't getting worse. I found a pretty good pace through the last 10 miles so. The morning alarms (I set two plus the hotel wake-up call) sounded at 4:30 AM. The in-room coffee maker served well enough to prepare my pre-race meal of organic oatmeal with berries and almonds. 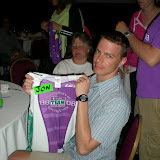 Mike and I met the rest of the Team in the hotel lobby at 5:30 so we could walk as a team to transition. 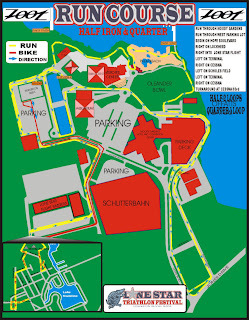 Note: 'transition' refers to a large penned area with three gates where the athletes park their bikes and gear. It serves as a hub with the spokes being 'swim-in', 'bike out/in', and 'run out/in.' With three legs of the event, we have two transitions, noted as T1 and T2. 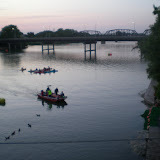 The national anthem completed over the loud speaker, our first wave was in the water and swimming shortly after 7:30. We were the wave with the green swim caps. As planned, I quickly fell to the back of the pack. I'm a slow swimmer and I was not about to defy expectations today. By the first tetrahedral pylon indicating our turn to the left, the blue caps were upon me. Waves were being sent four minutes apart. Halfway to the final turn, the yellow caps were in the mix. I was not the last greenie to finish the swim though - and my time of 45 minutes was right at what I expected to swim. And much improved over my 30 minute time at half the distance last year. Running up the carpeted path toward transition, I was well within my race plan. I waved to Mike, Tiffany, and the TNT gang watching us all come in. The wetsuit strippers helped me out of my wetsuit. More details to follow. Here's the quick and dirty. Campaign results: Our North Texas Team raised more than $175,000 for much needed blood cancer research. Event results: Everyone from our team finished their respective races. 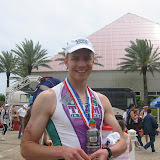 I completed my Half Iron Man distance in 6:16:02. We did it! Thanks to all of you for supporting the Leukemia and Lymphoma Society. Thanks for your encouragement in this triathlon effort of mine - it means a lot to me. Before I head to rest and then again to wake at 4:30 AM to prepare for a 7:30 start (my age group goes first along with the elite athletes), I wanted to leave one last dispatch (thanks to Mike W. for bringing his laptop on the trip). We just finished our Pasta Party, which as planned, offered a healthy dose of "acknowledgment, inspiration, and motivation." And a bit of instruction for our day tomorrow - repetition helps. We heard from a 31-year old father of three who told of his story of surviving stage 3 Hodgkin's Lymphoma. October 23, 2003 was the day he got the news - the day he'll never for forget. Today, he thanked all of us, and by proxy all you, for making his survival story possible. We also met the father of two of our team mates - two sisters who decided to join TNT in support of their father who is doing well after being diagnosed with a rare blood cancer. Gleevac has made all the difference to him, a drug made possible by funding from LLS. Positive energy abounds with this crowd. I wanted to send some of that energy and positivity out to all of you through the ether. Your support and donations have been noticed. And from the survivors I met this evening, I'm able to send you their thanks and appreciation. I'm off to Galveston. About a five hour drive from Fort Worth. Today calls for a packet-up, a pre-race meeting, an open water swim, and a pasta party organized by TNT. This will be my third pasta party with TNT. These are remarkable evenings. The team gathers to dine and "carbo-load." Add in visiting family. Add in very enthusiastic TNT staff (gotta love 'em). Throw in a few coaches with last minute inspiring and soothing words and bits of advice. Bring forth the honored heroes - cancer survivors who, like Doug Campbell speaking last year, share amazing stories of fighting and overcoming their disease. The net effect reminds everyone why we started this journey in the first place. It also takes us out of ourselves and our own nervous energy, bringing our attention back to those heroes and the Society we're striving to support. Thanks to all of you once more who I have the honor of representing, donors and supporters, the real Team behind Team Goodman. Wow, I'm very thankful for the response to the St. Paddy's Day appeal! We had about a $500 day. Truly awesome. 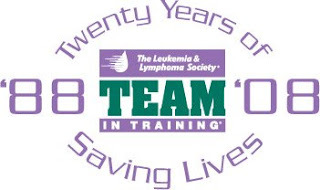 Thanks to all of you who have supported The Leukemia and Lymphoma Society - many of you for the second year in a row! I'm officially square with Team In Training - having met my minimum fundraising amount. I'm just shy of my goal of $3,000 and it's not too late to make a donation! If no stragglers make up the difference, I'll find a way to get across the line. I'm not going to finish a Half Iron Man and then not hit the fundraising goal. That's no way to cap a season that began in September! Under strict orders from our coaches, those on our way to Galveston this weekend have began to taper our training. The basic idea is to rest your body and avoid any taxing workouts in the final days leading up to your race. Pretty common sense stuff, but triathletes often fall into the "more is better" mode of thinking and need to be constantly reminded and cajoled to lay off. This leaves me time to work on my race plan, hydration and nutrition specifically. Elevated exercise for more than a few hours requires your body fuel and replenish fluids along the way. Coach Todd from the Dallas Team gave us a clinic a few months ago which helped a lot. It's time to put pen to paper and have an actionable plan for race day. Saint Patrick's Day (Irish: Lá ’le Pádraig or Lá Fhéile Pádraig), colloquially St. Paddy's Day or Paddy's Day, is an annual feast day which celebrates Saint Patrick (circa 385–461 AD), one of the patron saints of Ireland, and is generally celebrated on March 17. You'll find lots of cool history in this entry. Did you know that Boston has celebrated St. Paddy's Day since 1737? It's more than enough reason for me to have a Guinness. 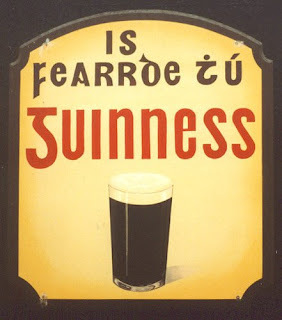 "Guinness is Good for You," as the poster to the right states, even for aspiring amateur triathletes. Thanks for the great holiday Ireland and for sharing it with the world! Northern California is pretty darn cool. 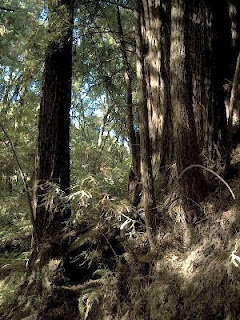 Today I saw one banana slug making his away across the trail and lots of redwoods while on a run through Nisene Marks with friend and coworker Andy B., ultra-marathoner . We ran nearly five miles into the park to the epicenter of the October 17, 1989, Loma Prieta earthquake, and then we turned around and ran right back out. This was one of the best runs I've done in a long time, in no small part because the course is gorgeous (thanks again, Andy, and Mark too!). 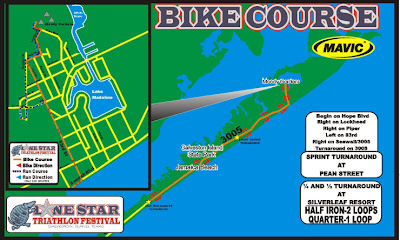 Two weeks left until Galveston and the the Lone Star Triathlon. Fundraising closes next week. Where has the time gone? The proverbial finish line is near. So many people to thank... (Fara, I will have a card coming to you in Portugal very soon!). If you want to help us reach our goal of $3,000 for this season - we are within reach - you can donate securely online via the season-two fundraising page. Our first open water swim practice had the Dallas and Fort Worth North Texas triathlon teams gather 9AM Saturday morning at Rockledge Park on Grapevine Lake. Everyone wore a wetsuit, those going to Hawaii for Lavaman borrowing from TNT alumni and other fellow team members. I tried out my new sleeve-less wetsuit recently arrived in advance of our race at the Lone Star in Galveston. The prevailing sentiment of the entire group was, "Holy crap, this water is cold!" And it was. You can't see the bottom or even your own hands in many cases. You can't stand up if you're tired. You can't stop and rest at the wall. You're surrounded by dozens of other people. Your surroundings are almost invariably unfamiliar. You can't swim in a straight line without "sighting" - periodically looking up during your stroke and navigating. For certain, my sighting needs help! My swim experience from Lone Star 2007 is proof of this. I have a hard time swimming in a straight line which is only exacerbated by cold and fatigue as my swim form breaks down and my stroke tends to cross my body. Knowing these things in practice will surely help me avoid them on race day. And practice will help me improve; we're back in the open water this next weekend for a practice triathlon.